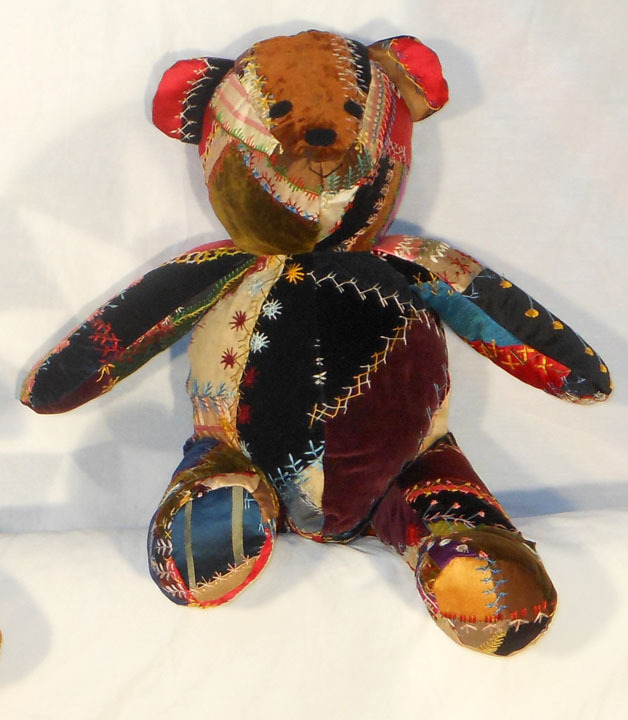 Over the years Betsey has purchased many wonderful antique and vintage textiles that were cherished and over-loved well beyond their original use as bed quilt or coverlet. 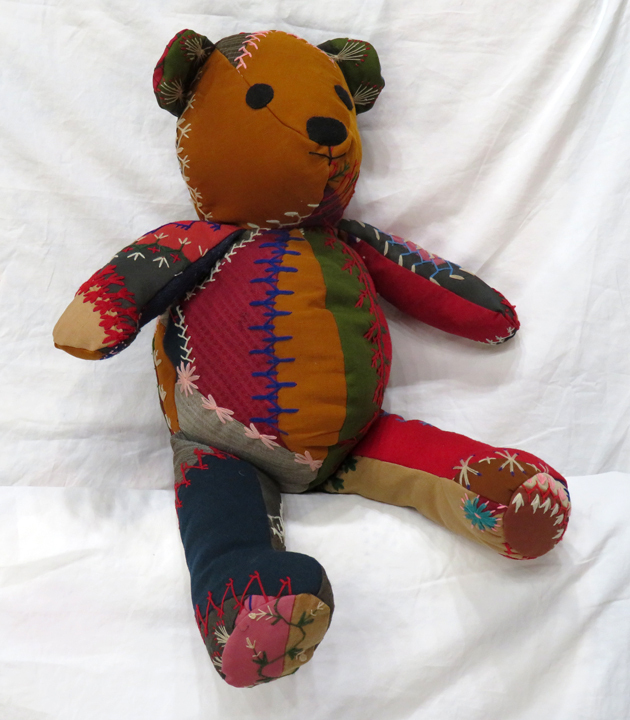 At Rocky Mountain Quilts we have taken the still perfect parts and pieces of each of these textiles to be reborn into a new life as a big-bellied stuffed bear. 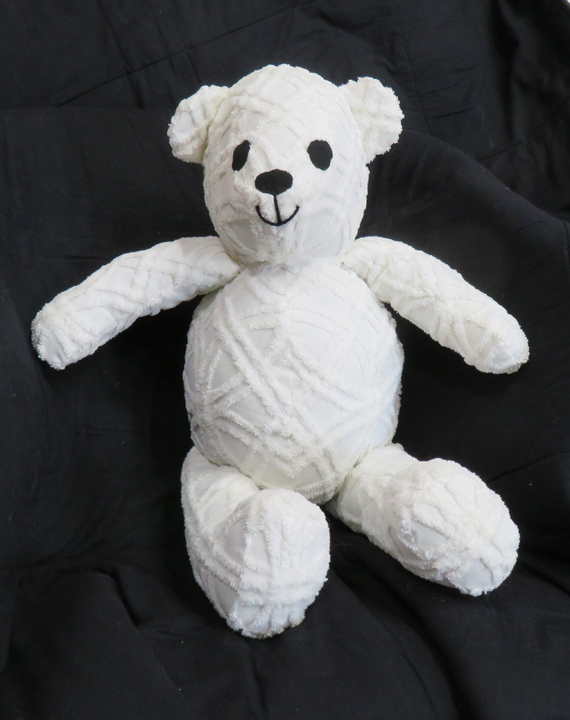 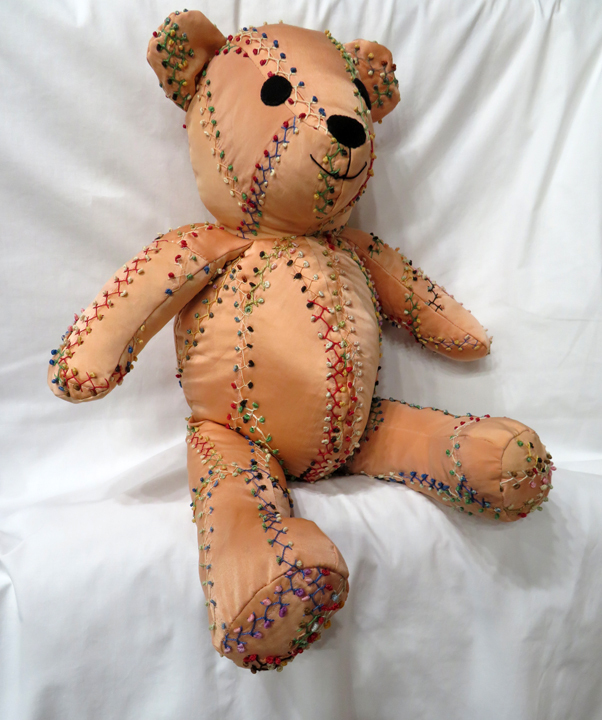 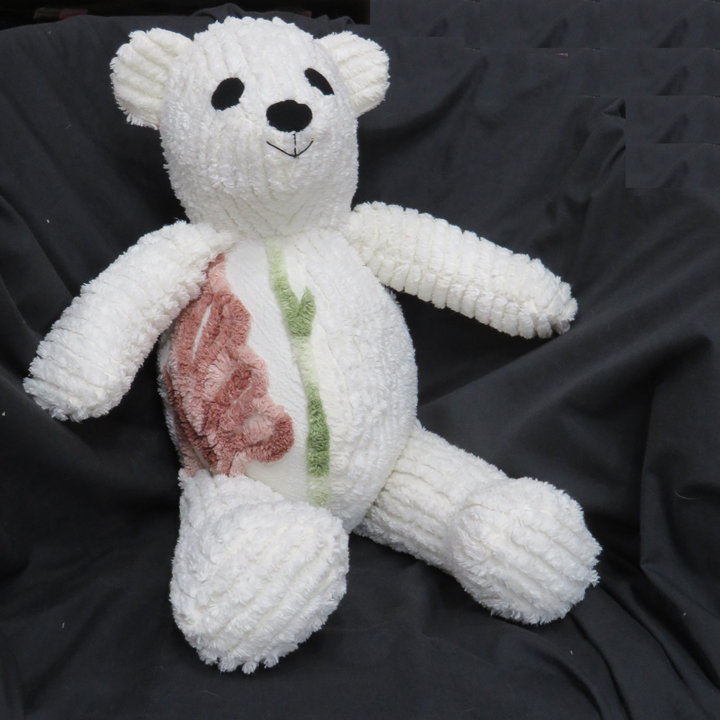 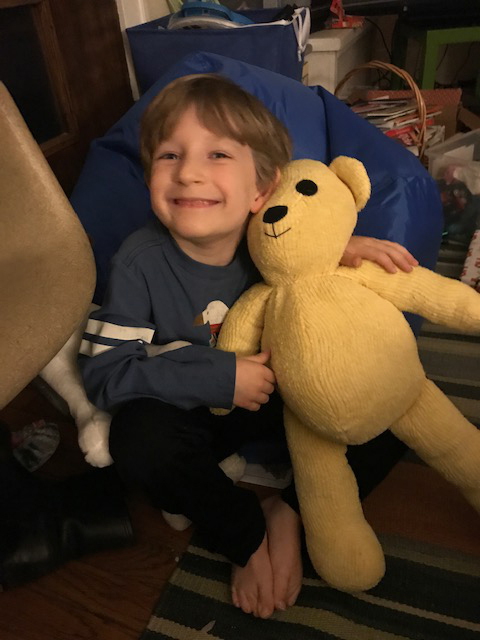 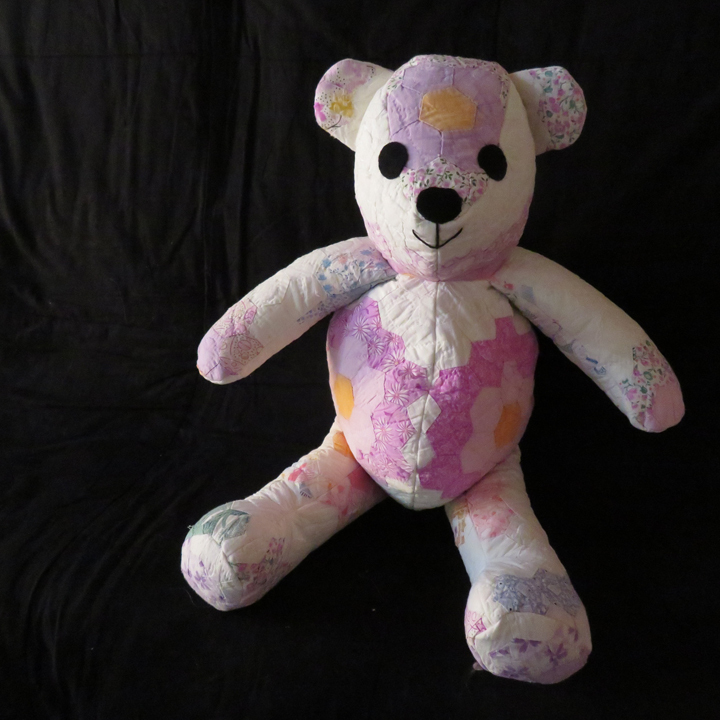 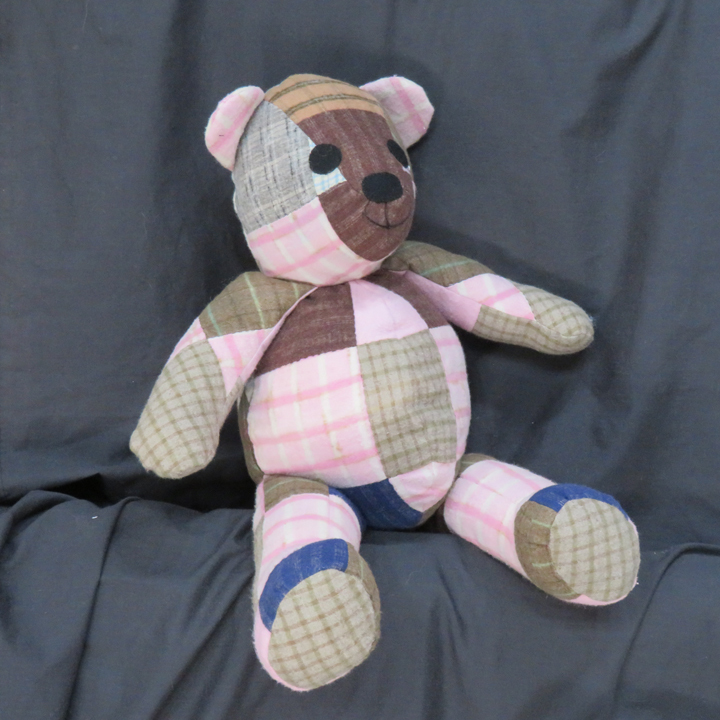 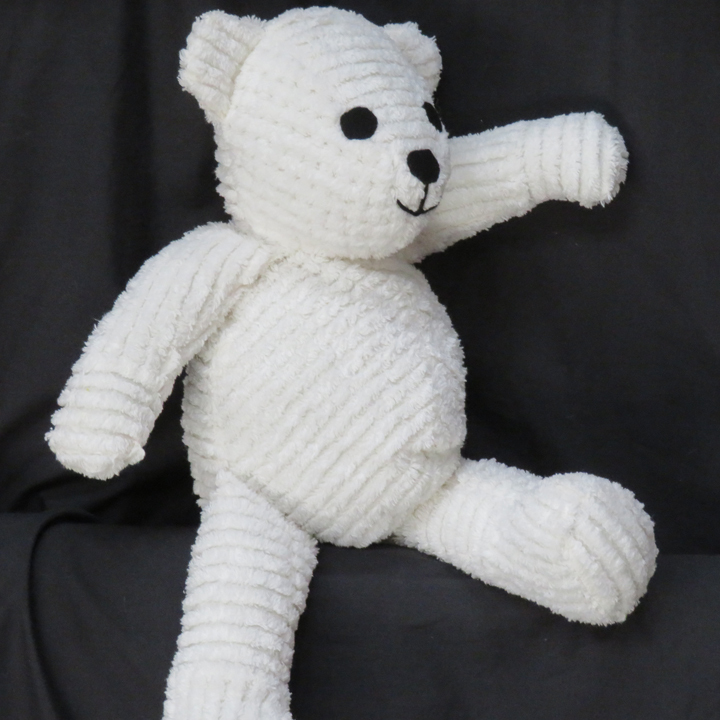 Some are just right as lovable, huggable bears perfect for newborns and very young children. 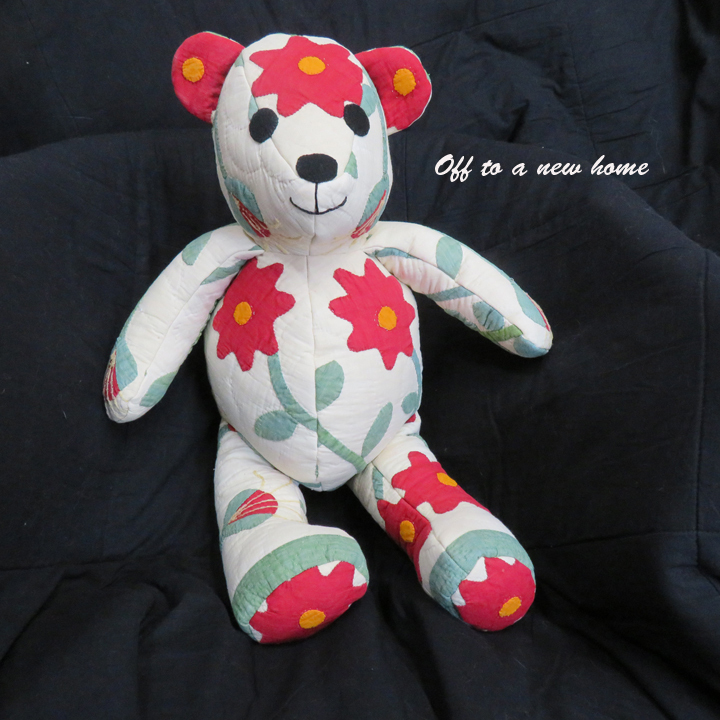 Others will begin their second life as a cherished friend or as a decorative accent in your home. 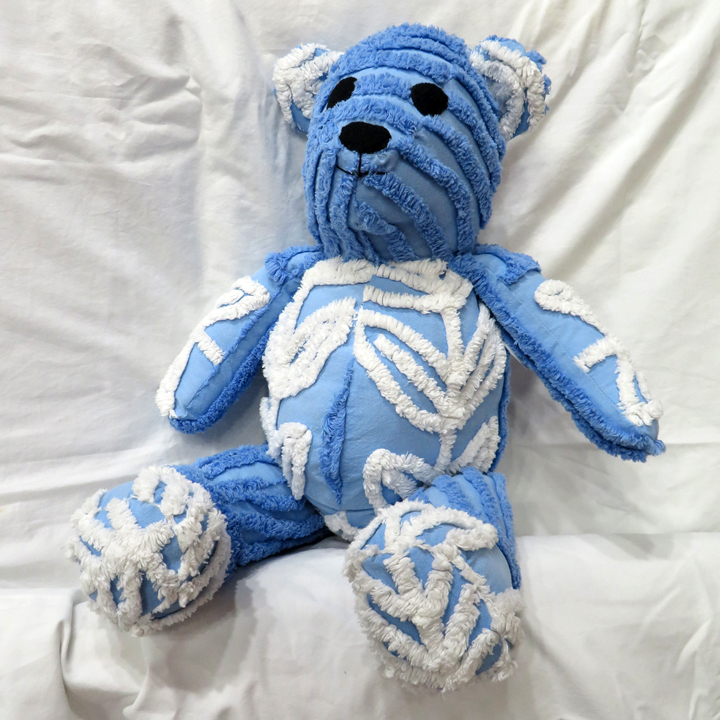 We have a wide variety of one-of-a-kind bears and our stock is ever changing so there is sure to be one for you, or to give as a special gift. 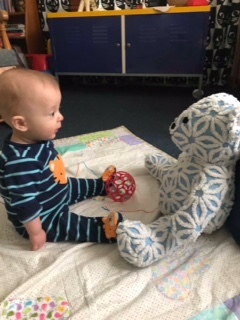 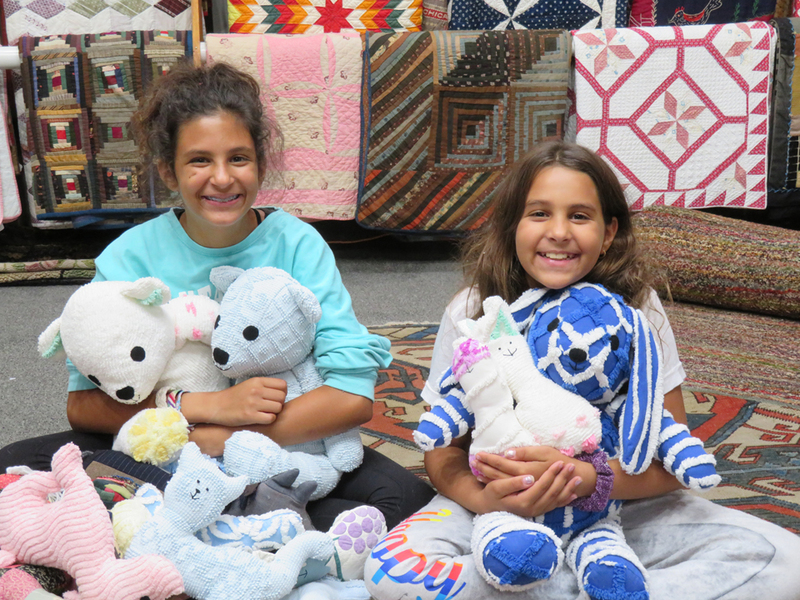 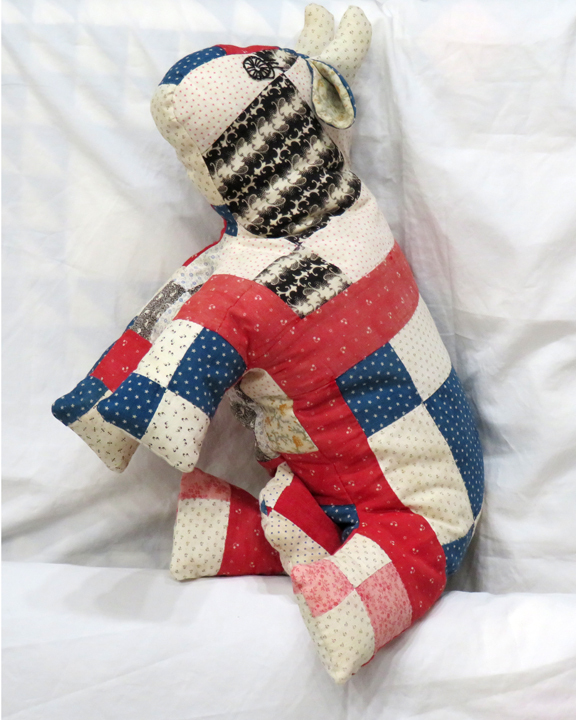 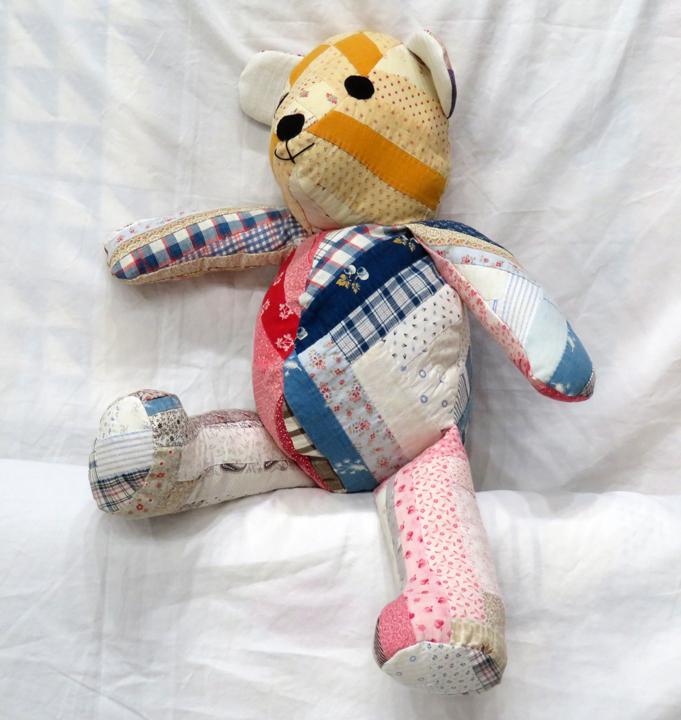 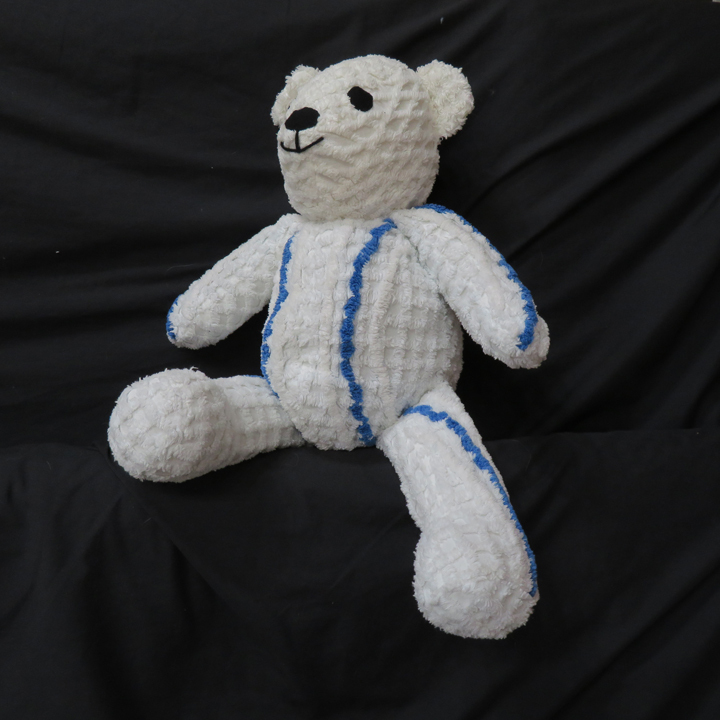 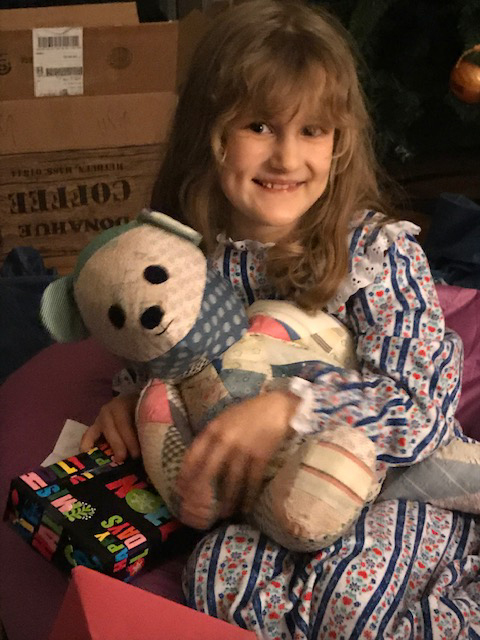 Our Big Belly Bears are made from fabulous 19th century wool and silk Crazy Quilts, Log Cabins of cotton, silk, wool and wool challis, gorgeous patchwork and appliqued quilts from the early 1800's up to the mid 20th century, even 19th century woven wool coverlets in two tone blues, blue and white, and patriotic color palettes. 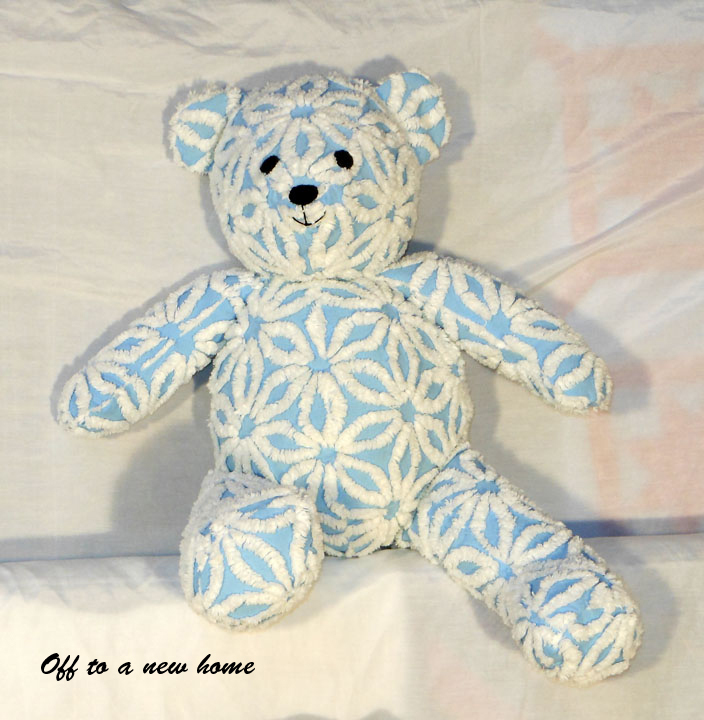 Wonderful 20th century cotton chenille coverlets in a rainbow of hues are born again into friendly, cuddly crib mates for baby. 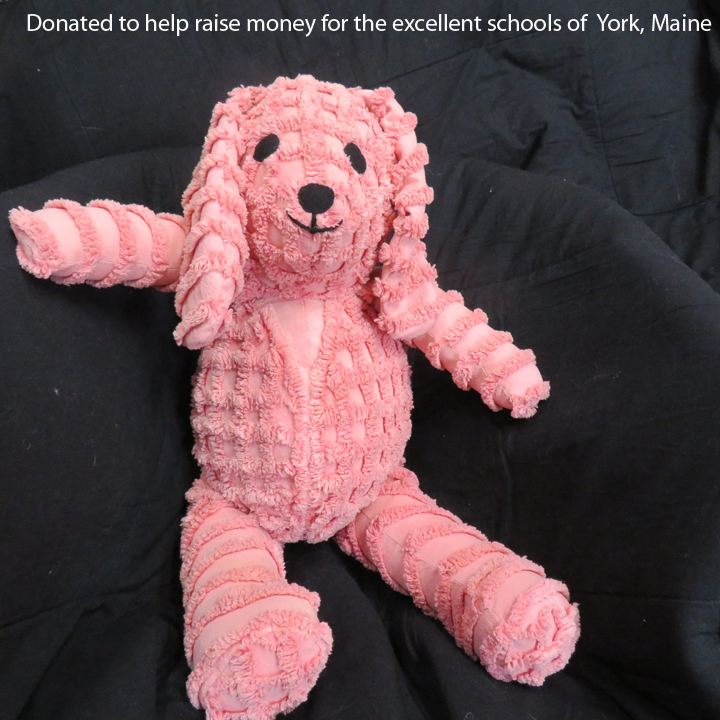 Over the years our Big Belly Bears have been a popular item at our York, Maine gallery and have found homes all over the world. 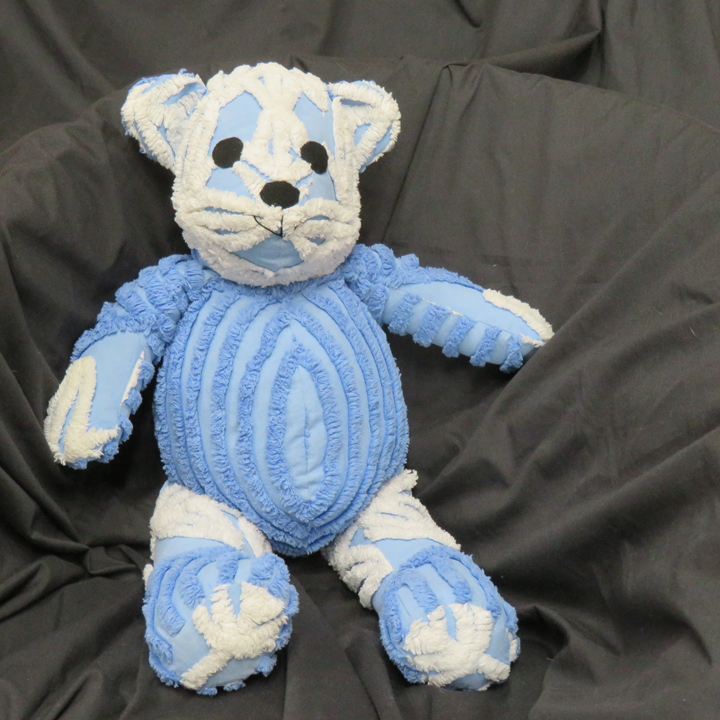 Due to popular request we are now offering them through our online gallery. 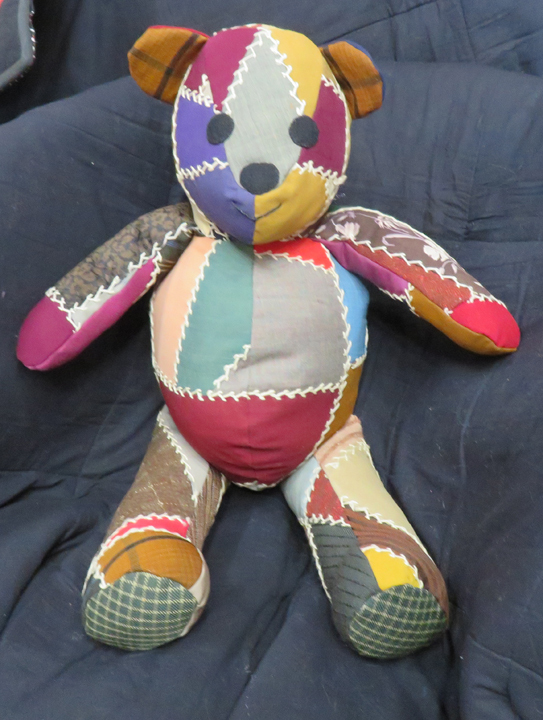 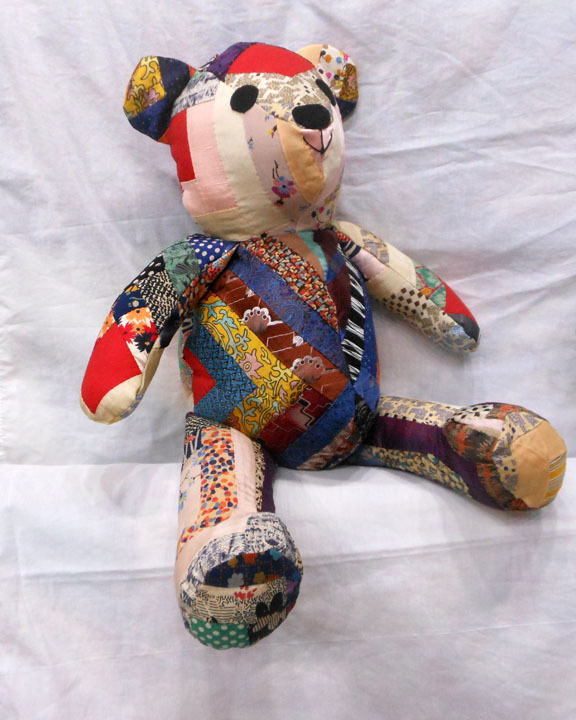 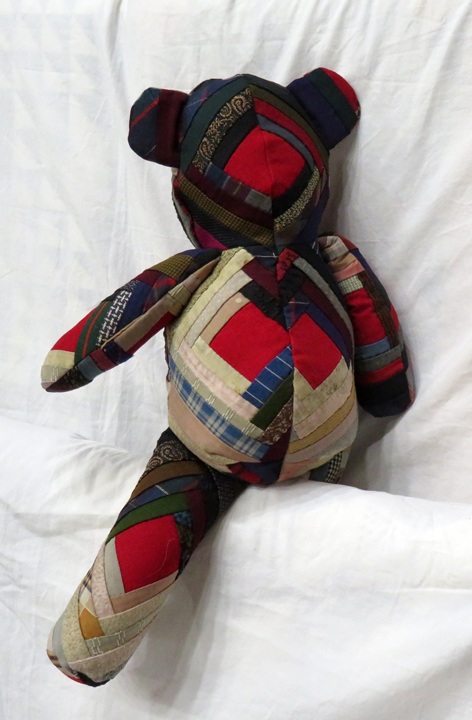 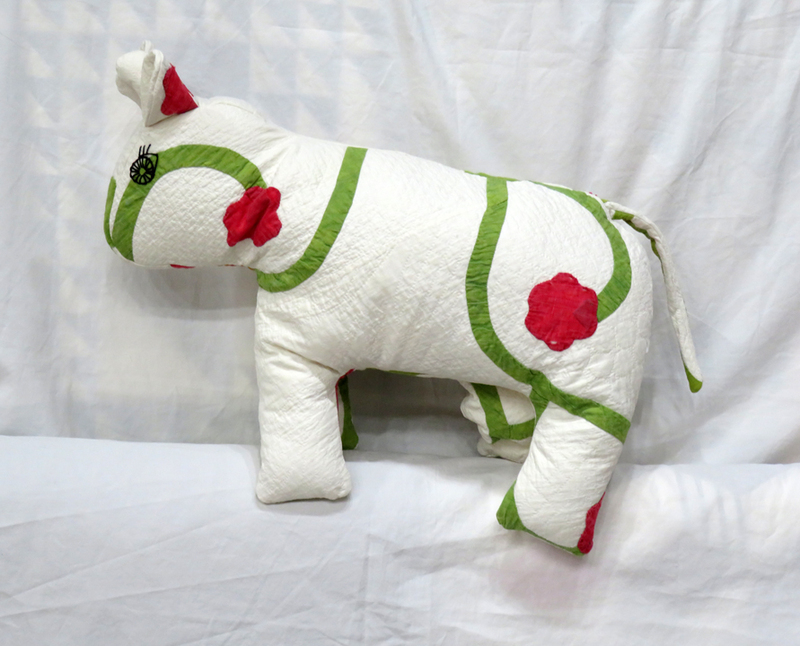 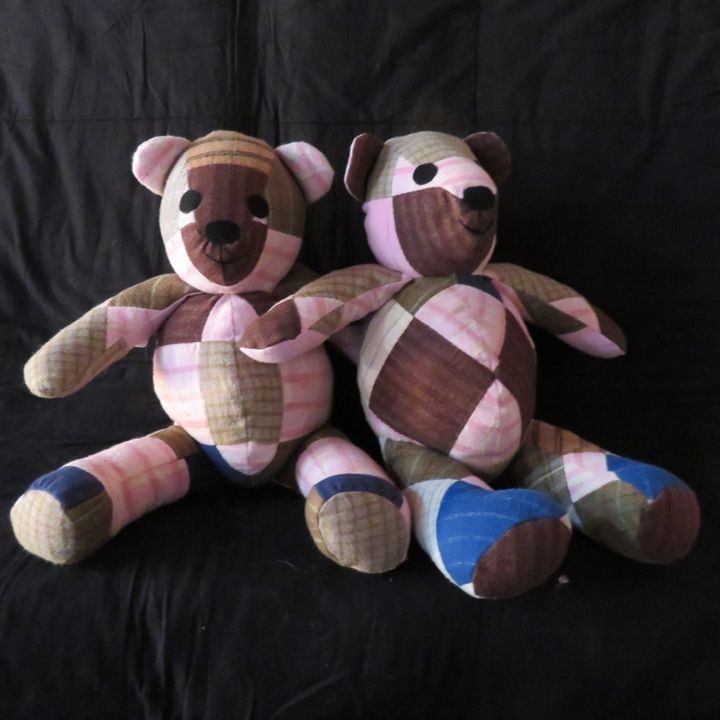 Now also available are some of their stuffed animal friends made from antique and vintage quilts and coverlets. 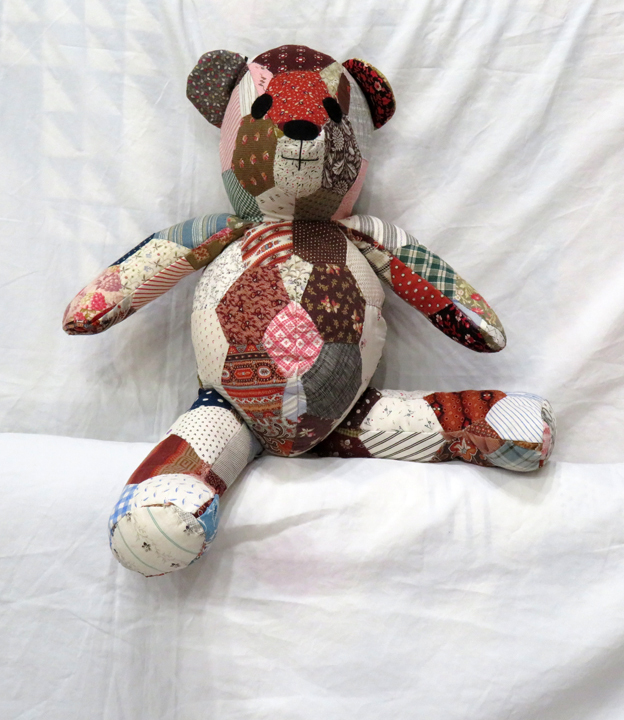 Welcome to the 2016 spring births of our Big Belly Bears. 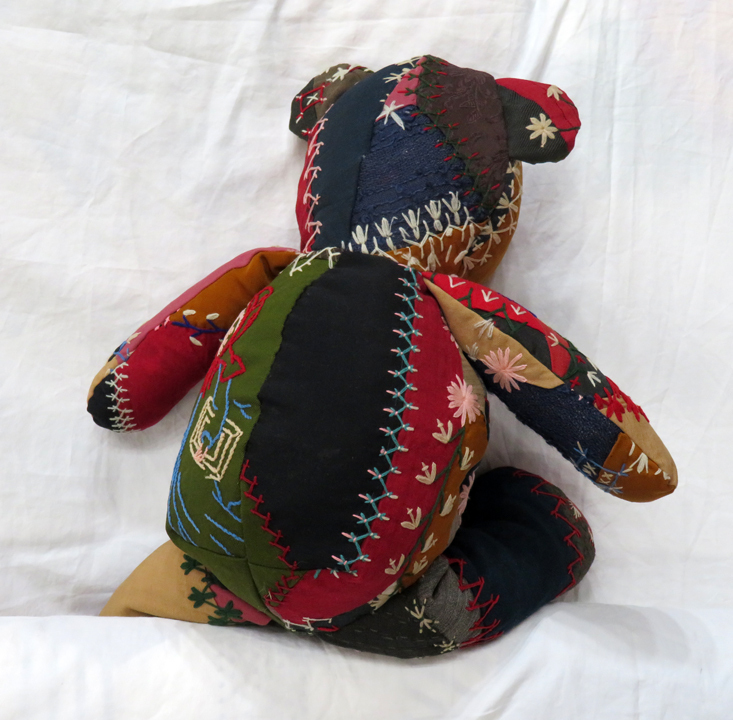 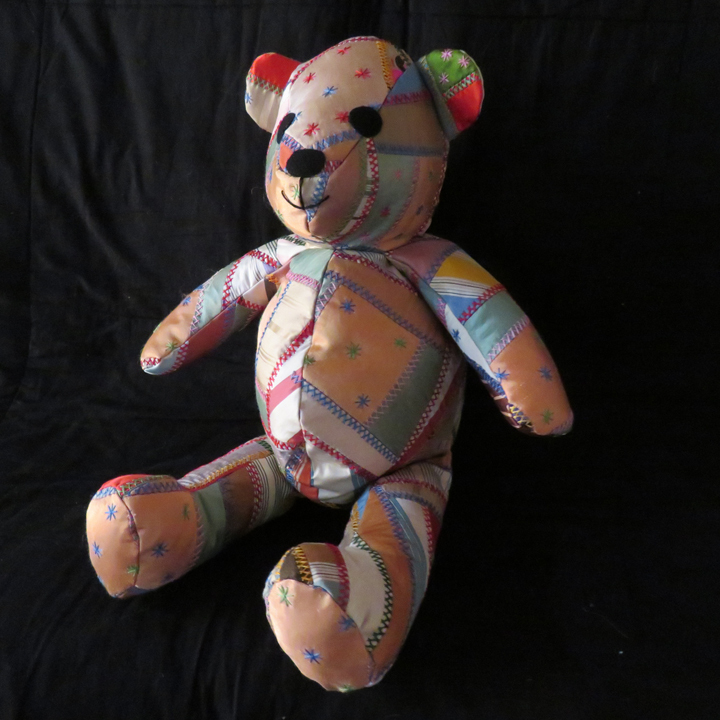 The date of each quilt they were born from, and the price, are under each bear. 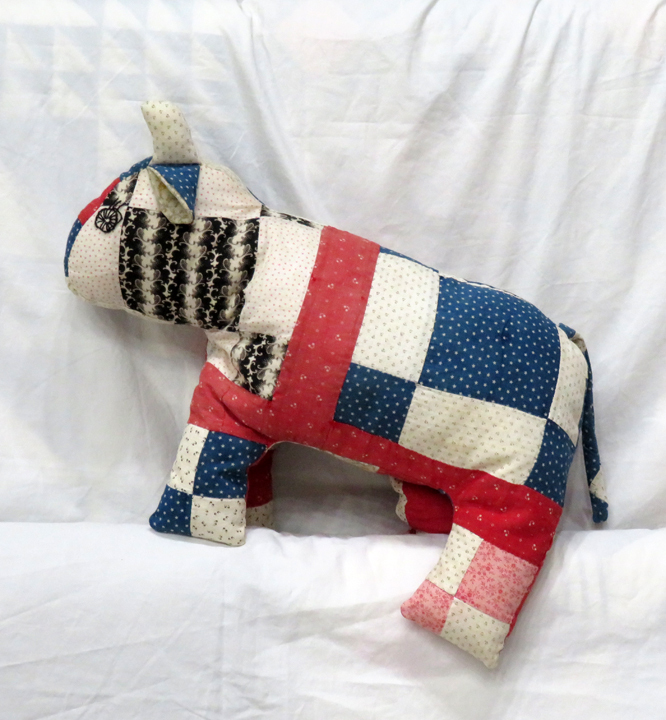 All the quilts have been hand washed, their insides are hypoallergenic, and they are so very very cuddly. 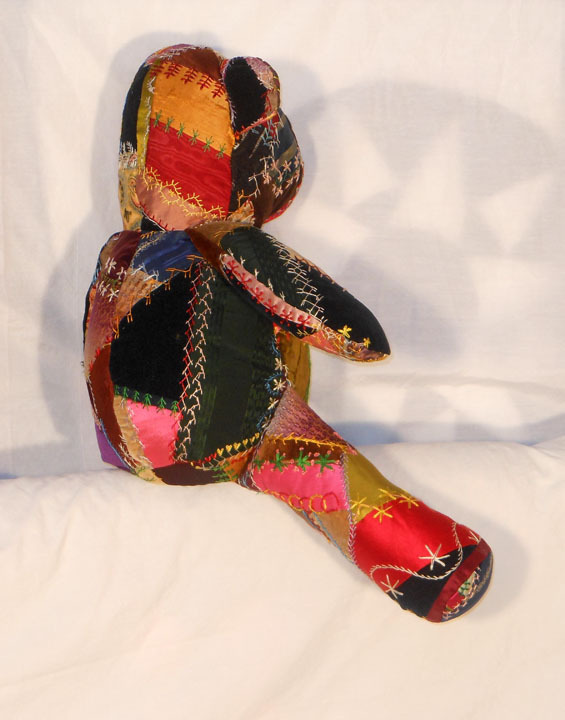 Big Belly Bears measure approximately 22 inches tall from top of head to bottom of feet, 13 inches tall sitting down, and 7 inches across their big bellies. 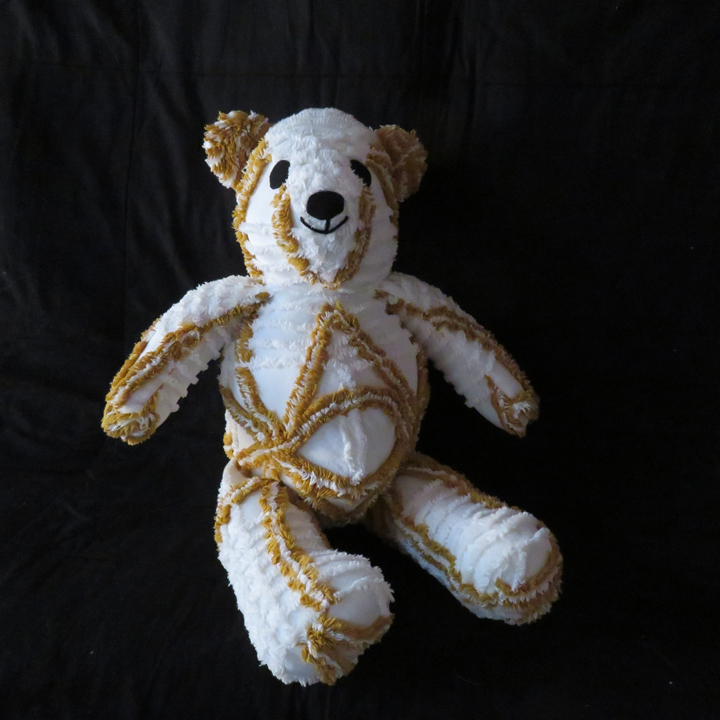 Shading is due to lighting, not representative of the bear. 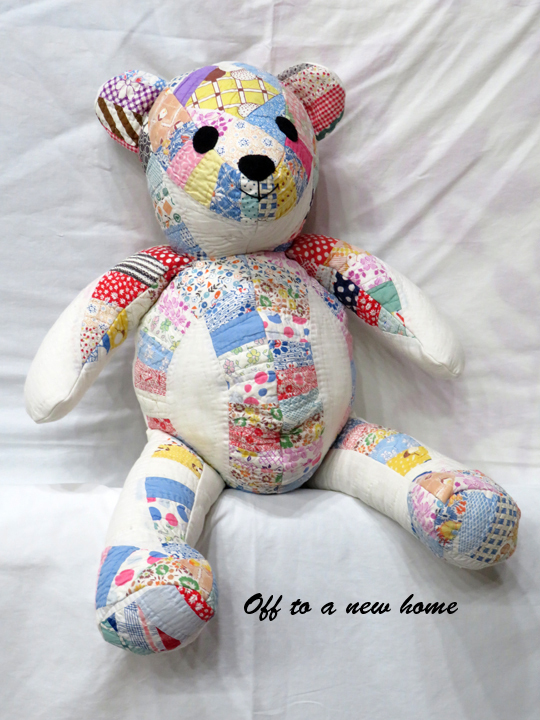 Please call for the availability or any questions. 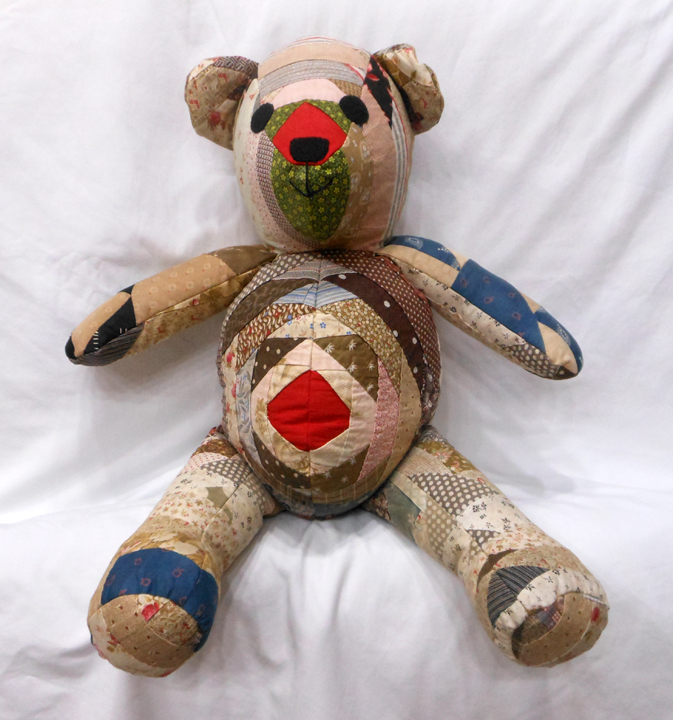 Thanks to the many avid fans of our family of Big Belly Bears, many of them have been sold. 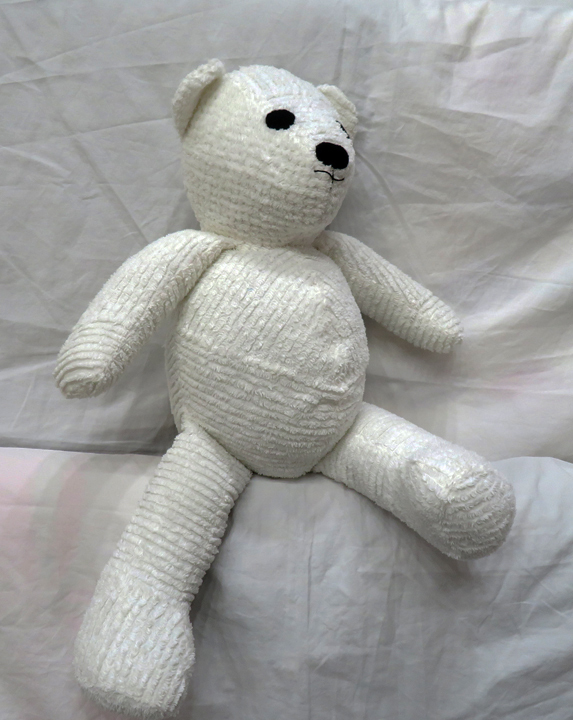 But there are quite a few left. 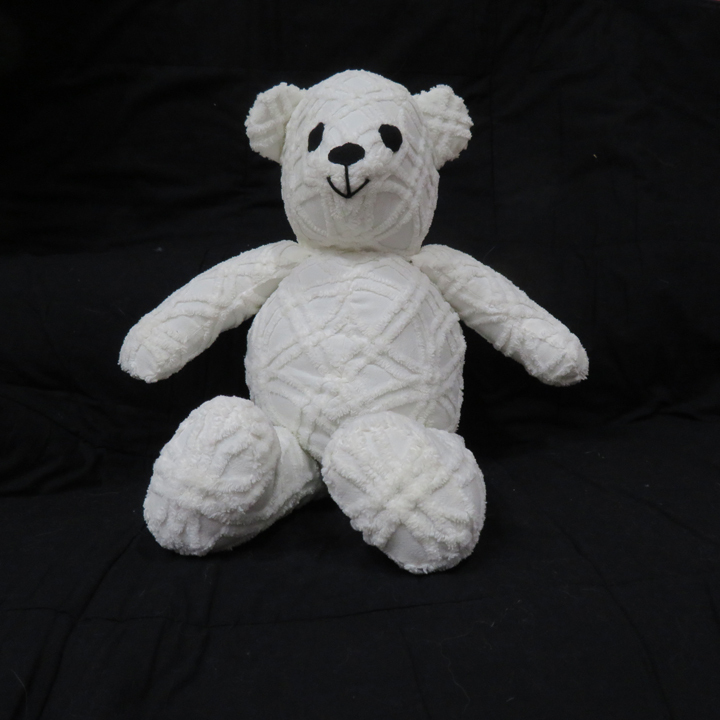 In addition, new bears are being born all the time who are looking forward eagerly to being adopted by a loving human in the near future. 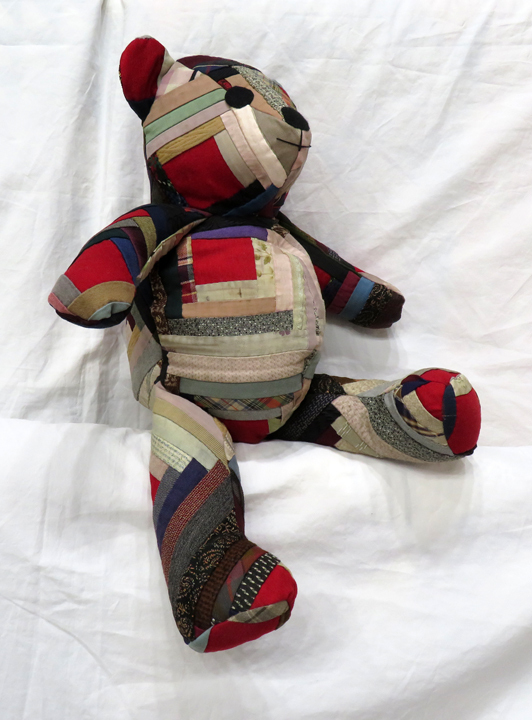 Rocky Mountain Quilts gladly accepts cash, checks, Visa, Master Card and American Express. 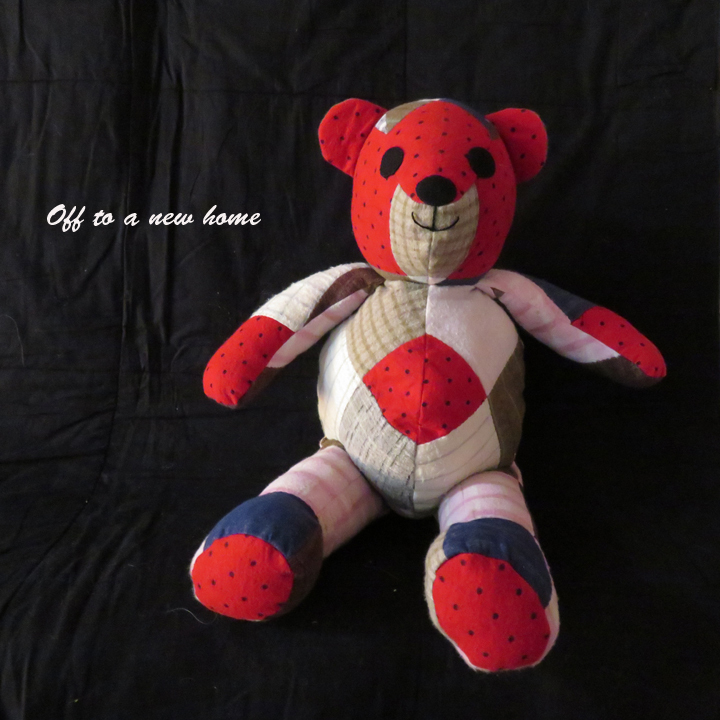 Bank wire transfers are an easy method of payment for both domestic and international sales. 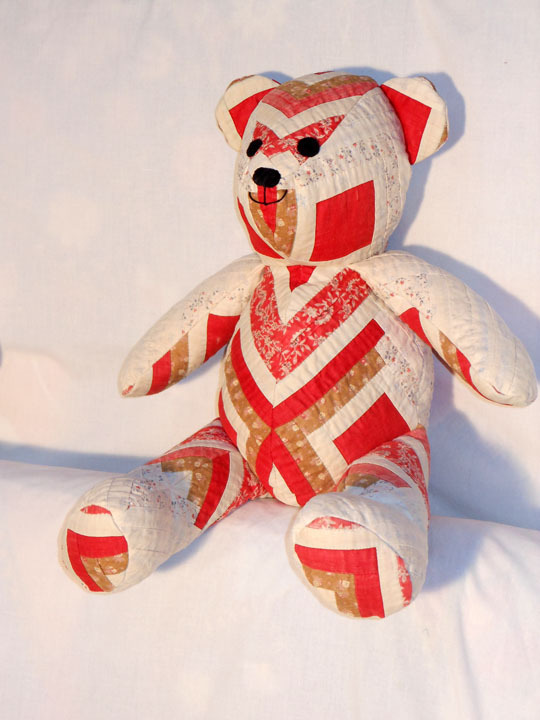 If you are traveling, we will be happy to ship your purchases via FedEx at your convenience.